Friday, May 18 – This week is about to be a big rainy mess. Last week was bad and it’s just going to continue so, bring out the ponchos and don’t get your hair done before this Disney vacation because it’s not going to last! Friday is going to be Hollywood Studios for me. There will be a lot of rain throughout the week but, Friday will also come with the highest humidity level. It’s going to be storming all day so you’ll want to stay inside. If you have a day to just hang at the resort, this is the day I would choose. Saturday, May 19 – For today, I am going to suggest Animal Kingdom. Saturday should be the last of the thunder and lightning all day but not the last of the rain. Rain is just unpleasant in the humidity but, thunder and lightning bring closures. At Magic Kingdom, Splash Mountain and Big Thunder Mountain Railroad usually close during storms and the parade/fireworks get cancelled. Epcot usually closes Test Track and in both cases it’s too many guests having to be in other lines for standby as well as FastPass+. If your ride closes due to weather, your FastPass+ becomes an open FastPass+ that lets you use it on other major attractions if you already have a major attraction booked. So while Animal Kingdom also can have closures during storms, I think it will be more manageable and the park will be open until 10:30 p.m. so there’s a good chance the weather will behave long enough to ride major attractions like Expedition Everest. Sunday, May 20 – Today is going to be Magic Kingdom for my pick! It’s going to rain again but luckily there’s not supposed to be storms attached. However, the rain is supposed to stop before nightfall so the Happily Ever Fireworks SHOULD still be happening whereas Friday and Saturday will be a big question mark there. Monday, May 21 – This week will switch up parks pretty well. Epcot is my pick for Monday! We’re at isolated thunderstorms today and no Extra Magic Hours so Epcot should be ok today. The lightning may cause periodic closures for a few booths and Test Track but, overall that shouldn’t affect things too much. Illuminations will still run more than likely and some isolated rain might actually make for a nice day with how hot and open Epcot can be. Tuesday, May 22 – For Tuesday I’m going to suggest Animal Kingdom. The daytime should be nice so you’ll want to knock out Expedition Everest and the Kilimanjaro Safari as early as possible. There will be storms at night so nighttime shows might be cancelled and that’s what I based my choice around for today. Personally, I think Rivers of Light is the nighttime show to miss out of the 4 parks if I had to risk one of them. That’s the advice I would tell my family and friends if they asked me so, that’s my advice to you as well. Before anybody freaks out, I’m not saying it’s bad at all because I enjoy the show, but the other three parks’ nighttime shows are what I would suggest to someone who hasn’t been to Disney or is unsure of what they want to do, plans wise. 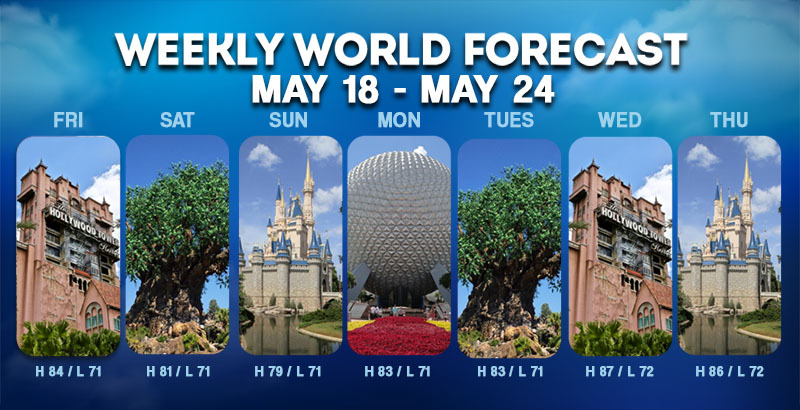 Wednesday, May 23 – Hollywood Studios or Epcot are both good choices today. I will lean towards Hollywood Studios though because of the isolated storms. There shouldn’t be any ride closures at all and the shows should all still happen. As of now, there’s a good amount of Fastpasses still available also. Thursday, May 24 – 100% Magic Kingdom. This is the only day that isn’t supposed to have any rain and I say that for this week AND next week. If your vacation starts about the 23rd and my list won’t be out for the 25th onward until next week, just know, it’s all rain right now. So, if there’s a particular park you really love and don’t want to get rained on, today is the day. If not, I suggest Magic Kingdom because it’s the quintessential Disney theme park. When I went through training to work at Magic Kingdom, they stressed how important that park was for a vacation and I agreed. People can handle a bad experience at Animal Kingdom, Epcot, and Hollywood Studios better than a bad experience at Magic Kingdom. If you’re bringing someone for the first time or if it’s the only time your family comes every few years, Magic Kingdom is where a lot of the memories are made for people, so keep that in mind while planning for your families.